What do Anna Kendrick, Heidi Klum and Rooney Mara have in common? They've all been made up by makeup artist Lauren Gott. The former model gets up close and personal here -- discover her tip to beautiful dewy skin, how she first got into the makeup business and so much more after the jump. I grew up in Louisiana. My home town is Lake Charles which is in the heel of the boot of Louisiana and right off the Gulf of Mexico. Upon completion of high school I was asked to go to NYC to model with Wilhelmina Models; my older sister was a model and I believe she had inadvertently shown her booker a graduation photo of me. I thought the notion a joke due to my underwhelming height and childlike ballerina frame. I knew I would never be offered an experience quite like modeling again, so I bit the bullet and decided to spend what I thought would be a summer in NY. My academic aspirations to study medicine were soon put on the back burner when I made the tough decision to accept agency offers in Europe. I thought, school will always be there, but this is a once in a lifetime opportunity I can only do when I'm young. It's baffling how one decision can alter your entire life and career course. Here's where the story gets amusing. As one could only imagine, my very Type A brain grew discontent with simply sitting in a chair for hours in hair and makeup or taking orders on photo sets. I wanted to be part of the creative process and be heard. I'll never forget while on a job in Italy I decided to offer my 2 cents of advice to a photographer. He barked, "You're a model, we don't care what you think!" Well that was the sad extreme, but as a result, I would instead thrive on working with those who did care what I thought and that paid off. I was fortunate to do a lot of beauty work which meant makeup and hair was more whimsical, fantasy-oriented and most creative. Sitting in the makeup/hair chair is where I would observe and ask infinite questions. After 6 years of working with some of the best makeup artists in the biz from Pat McGrath and Tom Pecheux to fellow Louisiana native Kevyn Aucoin, I was well into building my own makeup kit and experimenting on my own hair and makeup with self portraits. I was living in Paris at the time and beauty photographers soon took notice of my self-portrait Polaroids. I was asked to do my own hair and makeup for my first published beauty work. I thought that was the ultimate in creative control; I became a one-stop shop for makeup, hair, and modeling. My Polaroid technique carried on well into when I stopped modeling and wanted to interest photographers in my beauty story ideas. You have quite an impressive celebrity clientele! What are some of the favorite looks you've created? I've been fortunate to work with some very interesting people. Now, that is the single most, difficult question you've asked! I love doing looks with what appears to be the cleanest, velvety skin to the most colorful and elaborate makeup. That is the beauty of my job. I work with different people most every day and churning out work across a spectrum of what you could possibly fathom. 3) Lip balm -- with a natural cocoa, shea butter or beeswax. Petroleum-based lip balm defeats the purpose and dries you out in the end. 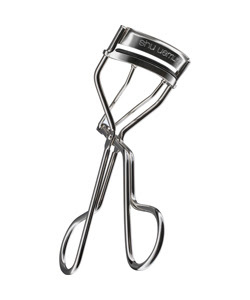 4) Eyelash curler -- even if no mascara is applied, this wakes up the eye immediately. 5) Cream color blush -- on the apple of the cheeks for a youthful flush and dabbed on the lips. That's all you really ever need to look super clean and polished. 1) Tone up your glistening skills. Get your glow on by applying iridescent sheer color cream (pearly moon white for lighter skin tones and golden color for darker skin tones) on the top of cheekbones, just under brows, the bridge of nose, and bow of the lip. 2) How now fine brow. The brow can really set the whole look of the face. Fill in brow with a wedged brow brush. Dip in a little water and a shadow color lighter or similar to brow. Brush on in light sweeps to mimic hair. Follow with a clear brow gel or mascara the shade of brow to keep them in place. The mascara will make them appear even fuller while the brow gel renders a feathered look. 3) Dew not grease is the word. The richer and thicker the better when it comes to moisturizer. Makeup glides on easily and makes skin look youthful and hydrated. Just use tissue, blotters or a little powder on the T-zone. The desired effect is dewy, not oily. If you have oily skin, a lighter cream will do although the delicate eye area always seems to do best with rich cream. I prefer not to use it on the lid if I plan to use powder eye shadow. If I do put cream on the lid, I apply powder on top to create a dry surface so that eye shadow pigment will blend and not look splotchy. I'm very active. I love running, kickboxing, dancing, cycling, water-skiing and anything with extreme cardio. Cooking, baking and maintaining a beautiful home are also things I truly enjoy and find relaxing. Last night's dinner was turkey shepherd's pie and peach cobbler.